Burrhus Frederick Skinner pioneered the science of behavioral analysis and positive reinforcement as an educational tool. 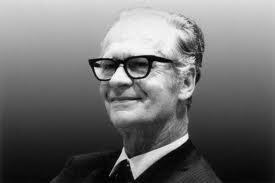 Skinner grew up in Susquehanna, Pennsylvania, a small railroad town thirty miles from the New York state line. His father was an ambitious lawyer for the Erie railroad; his mother, a civic-minded woman that continually reminded Frederick to be aware of "what other people think." Despite his mother's strictures, young Skinner enjoyed his Susquehanna boyhood, roamed the countryside, built ingenious gadgets, and did well in school. In 1922 he was valedictorian of his high school class, having gained a reputation for debating intellectual matters with his teachers. That year he enrolled in Hamilton College, just outside Utica, New York, where he spent a miserable first year as he lacked athletic ability and connections with Hamilton alumni. In his second year, however, he entered a social circle at Hamilton that appreciated intellectual and artistic life. He began writing short stories; one was praised by poet Robert Frost. Graduating in 1926, Skinner, against the advice of his parents, decided to spend the next year becoming a writer. He moved into their house in Scranton where his father had taken a position as general counsel for a coal company. It was Skinner's "dark year" as he discovered he had "nothing to say" as a writer. But he was drawn toward behavioral psychology, having read philosopher Bertram Russell's favorable review of John B. Watson's Behaviorism (1928). After a short fling with bohemian life in Greenwich Village, Skinner enrolled in graduate school at Harvard University in the psychology department. Skinner, however, was not attracted to psychology at Harvard so much as to the physiology of Professor William Crozier, a student of German physiologist Jacque Loeb. Loeb and Crozier insisted that real science depended on controlling experimental results rather than mere observation of the phenomena being studied. For Skinner the foundation of behavioral analysis became the control of experimental variables. By 1930 he had devised an apparatus to control a specific behavior of a rat. Starting with a runway resembling a rat maze, Skinner gradually fashioned a box with a lever that delivered a food pellet when the rat pushed it. He also invented the cumulative recorder, a kymograph-like device that marked a paper every time the rat pressed the lever. He allowed the rat (only one to a box) to be fed a pellet only after it pressed a certain number of times, a behavior control known as schedules of reinforcement. He was able to shape lever-pressing behavior so that every time a rat was put on a particular schedule of reinforcement the rate of lever pressing remained constant. The measured behavior was as regular as a pulse beat and marked the beginning of the science of behavioral analysis. Skinner took great pains to distinguish his science from the stimulus-response conditioning of Ivan Pavlov. The latter conditioned surgically altered dogs. He measured the increase in saliva flow (the response) when a bell was rung (the stimulus) before feeding. Skinner, on the other hand, always used intact organisms (either rats or pigeons), and was only concerned with lever-pressing behavior, never glandular secretion. He acknowledged Pavlov's pioneering work in reinforcement and conditioning but insisted that the science of behavioral analysis involved operant conditioning. By 1933 he admitted that there were a multitude of rat behaviors that were not conditioned in what became known as the Skinner Box. The rat ran about, stood on hind legs, sniffed, and so forth. But the operation (operant) of lever-pushing was controlled by the schedule of rein-forcement - not immediately by the food itself but by the sound of the magazine as it dropped the pellet. Hence although stimulus and response could not always be identified, let alone controlled, the operant or behavior of lever-pressing could be. The rat was not conditioned, only one class of rat behavior was. The Behavior of Organisms (1938) clearly established operant behavioral analysis as a new science. Had he only been exclusively concerned with the behavior of rats and pigeons, Skinner would have already secured a significant place in the history of science. But he became a social inventor whose creations (both mechanical and literary) made him one of the most controversial scientists of the twentieth century. The Behavior of Organisms announced Skinner's vision for the future of behavioral analysis: "The importance of a science of behavior derives largely from the possibility of an extension to human affairs" (pp. 441-42). Ultimately this extension would impact American education. Upon leaving Harvard in 1936 (he received his doctorate in 1933 but continued as a junior fellow) Skinner married Yvonne (Eve) Blue after accepting a position at the University of Minnesota. There he began to transfer operant science to social service. During World War II Skinner and a team of students developed a guidance system for bomb-carrying missiles. A pigeon was conditioned through positive reinforcement to peck the aiming device. But the army deemed "Project Pigeon" unfeasible for wartime use. Disappointed but not discouraged, Skinner moved more directly into a career as a social inventor. He turned his attention to building a baby-tender, later trademarked the aircrib, for his youngest daughter, Deborah. The contraption was a carefully designed enclosed space, thermostatically controlled to allow the infant to move freely without constraining clothes. The child could be removed from the baby-tender at any time. It also freed the mother from constant vigilance over the baby because the infant was much more secure than in a conventional crib. Skinner did not do operant experiments on Deborah in the baby-tender; rather, it was designed to improve the quality of life for both mother and child. After an article in Life magazine, the baby-tender was immediately criticized as another Skinner Box, one that imprisoned the child and destroyed the intimate mother-child relationship. For the first time Skinner's fascination with social invention had thrust him into national limelight and controversy. Thereafter Skinner became evermore controversial as he moved aggressively into the possibilities for using operant science to build a better world. Walden Two (1948) envisioned a planned environment that shaped the behaviors of a community using operant techniques of positive reinforcement. Community cooperation and welfare were seemingly naturally conditioned and destructive competition disappeared. The novel met fierce critical commentary as many Americans thought it a grotesque distortion of Henry David Thoreau's Walden. Nonetheless by the late 1960s the book became a best-seller and several actual communities were established modeled after the fictional Walden Two. Leaving the University of Minnesota in 1945, Skinner spent three years at Indiana University before returning to Harvard in 1948. In November 1953 he visited a Cambridge school where Deborah was a student and was appalled by the mathematics instruction. Students were given problems to solve while the teacher walked up and down the aisles, helping some but ignoring others. Some students finished quickly and fidgeted; others struggled. Graded papers were returned days later. Skinner thought there must be a better way and immediately fashioned a crude teaching machine by cutting up manila folders. The manila folder effort evolved into a slider machine used mostly for arithmetic and spelling. Math problems, for example, were printed on cards that students placed in the machine. The right answer caused a light to appear in a hole in the card. Later he made a device that allowed students to compose answers to questions on a tape that emerged from the machine. Later still, students could compose answers on cardboard disks. A lever was moved that covered the student's answer with a Plexiglas plate - an innovation that prevented altering the answer and also revealed the correct one. Students mostly answered correctly because questions were designed sequentially from simple to complex. This "programmed instruction" was engineered with positive reinforcement coming from correctly answering the questions. With few mistakes the student progressed rapidly toward mastering arithmetic and spelling. Hence, learning behaviors were shaped by immediate positive reinforcement. Skinner did not invent the first teaching machine and gave full credit to Sidney Pressey of Ohio State University who had developed a revolving drum device in 1926. Pressey's machine allowed students to press one of four buttons that revealed the correct or incorrect answer - in effect a multiple choice test. Skinner's machines, however, facilitated programmed instruction designed as sequential positive reinforcement. The teaching machine simply transferred immediate positive reinforcement to the mastery of subject matter. One teacher could not possibly immediately reinforce twenty or thirty students in a classroom. What was needed in American education was a technology that incorporated operant conditioning to shaping the learning behavior of each individual student. Skinner assembled a group of former students and colleagues to produce programmed instruction across of full spectrum of subject matter. He convinced companies such as IBM and Rheem to develop prototype teaching machines that could be mass produced. He hoped for a revolution in American education that he described in Technology of Teaching (1968). But the companies refused to aggressively market the machines and educational leaders, most notably former Harvard President James Bryant Conant, though initially enthusiastic, lost interest. IBM and Rheem could make more money on safer investments, while Conant believed the machines and programmed instruction had not proved their viability to educational experts in each subject area. Then, too, the fears of school administrators and teachers over losing control of a traditionally structured classroom, and perhaps also their jobs, dampened enthusiasm for the teaching machine and programmed instruction. The failure of his teaching machine to become as common as automobiles and televisions was Skinner's most bitter disappointment as a social inventor. He fervently believed that the survival of American culture depended upon a revolution in education. With population growth threatening to overwhelm the ability of people to avoid catastrophic wars and ecological disasters, only a technology of teaching incorporating behavioral science could properly educate a citizenry capable of effectively coping with an enveloping ominous world. Beyond Freedom and Dignity (1971) was Skinner's last and most controversial social statement. He attacked what he believed were the fictions of individual freedom and autonomous man. Every person was under the control of his or her evolutionary, cultural, and immediate operant or behavioral contingencies. What was needed was not only a frank admission of this reality, but the application of the science of behavioral analysis to social problems - most importantly to the obvious failure of U.S. schools. But the critics and the public read the word beyond in the book title as in place of and were enraged. Skinner made the cover of Time with the inscription, "B. F. Skinner Says We Can't Afford Freedom." He was bewildered by the firestorm of criticism and spent his remaining years answering critics and defending behavioral analysis. He never quite understood the historical entrenchment of treasured American values such as freedom and autonomy. Nonetheless, the alternative road for American schools that Skinner, a great and provocative thinker-inventor, devised remains an important contribution to the field of education.